Lana Baumgartner was born in the late ‘90’s in a rundown and poverty stricken area of New York. She never knew her father and her mother, a petty criminal, wasn’t the best of role models. They bounced from place to place, living in both New York and Gotham, wherever her mother could find work, whether it was legit or not. Lana’s schooling suffered as did her attitude, which became quite belligerent at best. There were a few times she was suspended or expelled from school. There we no early signs of her metahuman gene, the Specter’s curse saw to that. She was 12 when the curse was lifted and it was a few months thereafter that her power first manifested, blowing up the living room on their Gotham Apartment. Which resulted in their final move back to New York. Her mother thought Lana’s powers would be useful and coerced her into robbing banks. They went on a bank robbing spree, a few of the heists were successful but most were foiled by the influx of masked heroes that were working in New York. After a couple of years the two were finally caught. While her mother was sentenced and sent to prison, Lana was arrested, spent a few months in a Juvenile Detention Center and then released because of the circumstances of her crimes. With her mother coercing her to do them she couldn't be completely blamed for her acts. She was put on probation and made a ward of the state. Because she was a metahuman, with untrained powers, capable of great destruction they weren’t sure what to do with her afterward. 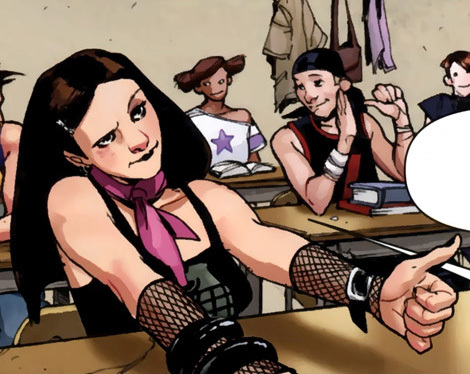 Thankfully Xavier stepped in and offered her a place at his school. She went begrudgingly at first, but has since found her place there, though at times it is shaky. Motivation - Lana’s childhood wasn’t the greatest. Moving from place to place, getting into fights at school, being forced into committing crimes by her mother, etc. Now that she is away from such a bad influence she wants to make up for her younger days, and rise above her poverty stricken and crime filled past. Hopefully with the positive role models at Xavier’s she will be able to do this. Goals - Her main goal is just to survive high school with passing grades and get a scholarship to college. 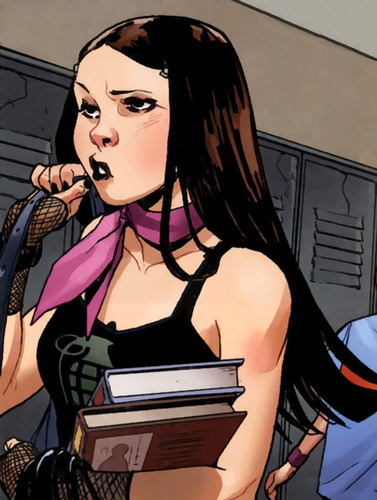 She is quite interested in joining one of the hero teams that start cropping up, or maybe even starting one of her own amoung the students of Xavier’s. Other than that her goals are those of any teenage girl, having fun and boys. Belligerent - Lana’s upbringing has left her quite aggressive. She is more prone to using her fists to solve problems than to use words. The few years in Xavier’s has dulled the edge but she still has to watch herself or she finds herself reacting violently without thought. She is also prone to swearing a lot and at the slightest provocation. Stubborn - Having been used for criminal acts by her own mother, Lana has decided that she won’t let anyone use her again. It’s hard to convince her to do anything she doesn’t want to do. Jaded - Living in the worst parts of New York and Gotham, Lana has seen a lot of things that shouldn’t been seen by even adults. This has left her being quite cynical about things and she always has a sarcastic or cynical comment at the ready. Her faith in humanity is slowing starting to be restored, but she has a long way to go. Adaptable - With all that Lana was seen and done she has learned to be quite adaptable. She can pretty much accept things that most would balk at. Very little shocks or surprises her. She is quite unfazable. Distrustful - Lana doesn’t trust easy. She was used to hard and heavy, by her own mother to allow for that. It takes quite awhile for her to warm up to people, and even longer to trust them. As hard as it is to gain her trust, it is very easy to lose it. Loyal - Despite all, Lana does have a loyal streak. She stuck by her mother despite how she was put through. Once you have gained her trust and can be considered a friend she will remain loyal to the end…well unless you betray her, then all bets are off. Energy Blast - Lana is capable of emitting blasts of energy from her hands. These blasts can vary in intensity, from being meager enough to just knock something out of a person's hands (with no damage to them) to intense enough to blow up a car and do quite a lot of residual damage in the process. The energy blast is accompanied by a concussive blast of noise that is equal in intensity to that of the blast and capable of a residual damage as well. Flight - Lana has learned that by directing her blasts she can use them to fly for short distances. She can’t fly at extreme speeds, her max has been approximately 100 mph and that was over a distance of a few miles. She could probably cross the island of Manhattan in a few minutes with a couple of quick blasts but to go any further she would have to land and start over. Xavier's School - As a student at Xavier's school she has access to all the school has to offer, equipment, tech, a knowledgable and helpful faculty, etc. NYPD - Sure she is a former criminal, but she does have a probation officer, and while they don't always see eye-to-eye she can go to him with any problems she may get herself into. Scrapper - With Lana's belligerent attitude she has been in quite a few fights. All these encounters have taught her a think about fisticuffs, hit hard, hit fast and hit dirty. She has no real training at this point and can probably handle one or two assailants i.e your common street thug. 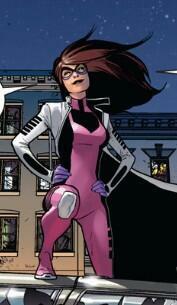 Trained or superpowered she has to rely on her powers. Quick Change - This was something to learned out of necessity. During their robberies, Lana and her mother would be in costume, and when they were fleeing would quickly change out of them into street clothes to blend in with pedestrians. She can change from street clothes to costume in less than a minute and go from costume to street clothes in less than a minute and a half. Evasive Maneuvers - Lana doesn't have any formal training in acrobatics or gymnastics but in her years of having to defend herself against the world she has learned the basics of not being there when a punch is thrown. She can dodge the fists of your common street thug, but not bullets or the moves of a trained fighter. Tech - Lana's a teenager, one that attends one of the poshest private schools on the eastern seaboard. They have the top of the line technology and she has been taught how to use it. She can't do any major hacking or anything, but she can troubleshoot the most common tech problems, perhaps even so of the not so common ones. And like with most teens social media is her go to form of communication. Cooking - When you have a petty thief for a mom, that sometimes spent the evening do what thieves do, you learn to fend for yourself. Add a stint in juvvie to that, where you had to make yourself useful, you learn some skill. Lana's was cooking. She is no gourmet by any means, but she can make a pretty good meal without burning anything. Criminal Record - Robbing banks, destruction of property, resisting arrest, this is just a few things that are listed if a background check is done on Lana. She is well known to the NYPD and the GPD, and while she has kept out of trouble for years now, they still keep an eye on her, waiting to haul her off if she slips up. Powers - A condition of her probation was no powers outside of that required to learn to control them. If she is caught using her powers in public she could easily get her probation extended or worse land in juvvie or jail again. Will this stop her in dire straits, probably not, but it does make her think twice before just blowing some asshat across the neighborhood for looking at her funny. Temper - Lana has a short fuse, it doesn't take much to set her off and have her cursing a blue streak. Her big trigger is comments about her past, but there are quite a few more as well. When she gets angry she is prone to acting without thought which usually ends in people getting hurt. Supergirl, aka Linda Danvers is my BFF at Xavier's. As weird as that sounds, it's true! The Headmistress, it's impossible to stay on her good side, mostly cause she can read minds. My totes fav teacher. Supposed to be teaching us P.E.